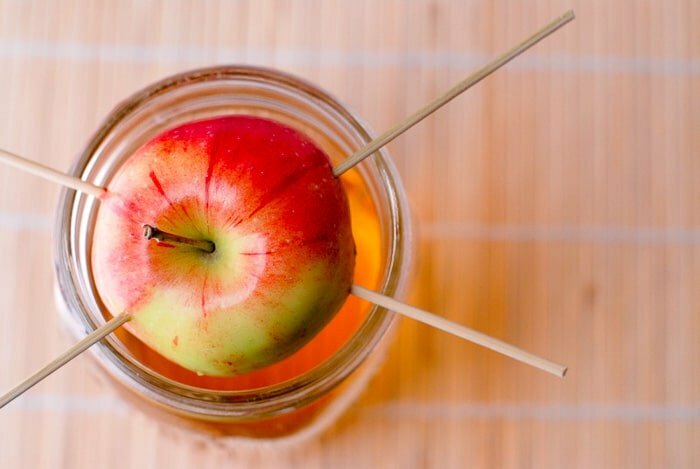 Making your own Homemade Apple-Infused Vodka is easy and inexpensive. It only takes two ingredients a few days for infusing. You’ll love all the ways you can use the vodka when it’s ready! This week I posted a fun vintage recipe redo in which my task was to iterate and update an apple fritter recipe. First thoughts were something like a croquette, which then turned toward a Sopapilla. For those who have enjoyed this fried, puffy bread served as dessert at Mexican restaurants, you would know it is always served with honey. I had wanted to serve it with honey infused with chilies (which I hoped to make myself) and thus began my research about infusing. I learned infusing most anything is very simple. For my specific recipe task I ultimately decided to pair my final recipe choice (Apple Pork Mini Empanadas, gluten free!) with an Apple Martini made from vodka I’d infused myself. I chose apple because of the flavors in my dish but you can infuse anything into vodka (and probably other liquors though vodka is ideal due to its minimal taste). When I was searching for my beet breakthrough recipe last fall, someone shared the idea of beet infused vodka (not quite there yet). How long to let it ‘soak’: I read that the vodka will have picked up the flavors within a few days. I put mine together before the holidays and frankly forgot about it so it infused for two weeks. It has a delicate flavor of apple and is the most gorgeous color amber. I do not think it can soak ‘too long’. 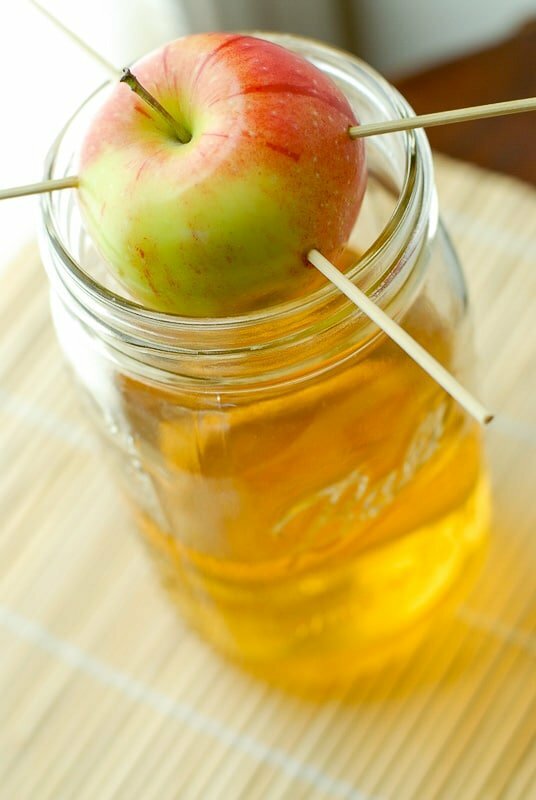 You will note the apples begin to oxidize (turn brown) which is due to exposure to the air in the jar. 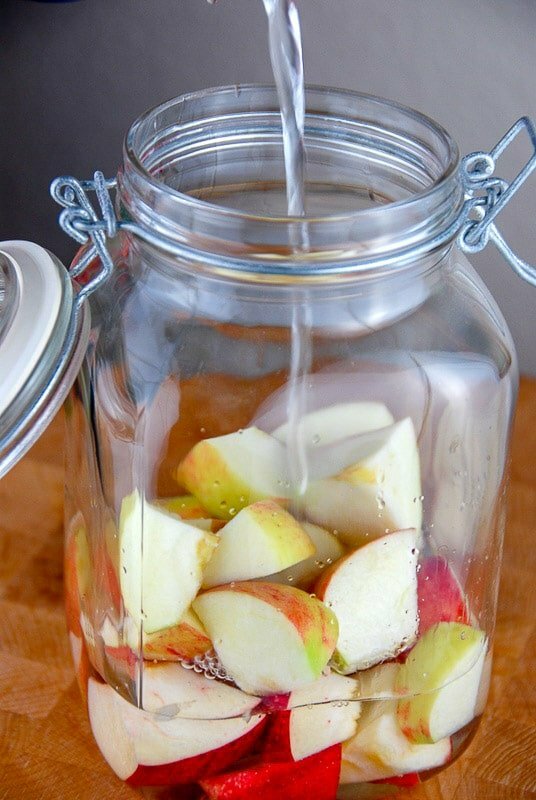 When you are happy with the infusion, strain the vodka into a fresh jar and discard the apples. It's so easy to make naturally flavored vodka at home and Apple Vodka is a favorite. 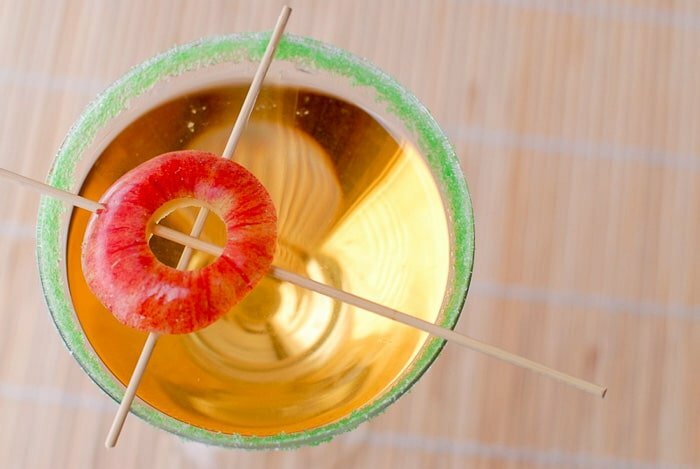 Keep it in a cook, dark place and add it to favorite cocktails for a natural apple flavor. Makes 2 cups vodka (aproximately) and 1 martini. Recipes may be increased keeping the ingredients proportionate. 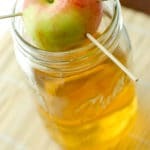 Add apples to a sealable glass jar. Pour vodka into the jar (should cover apples; add more if it doesn't). Place in a cool, dark location and allow to soak a minimum of 4 days and up to two weeks. Shake jar or stir daily. Strain apples and store in a cool, dark place. 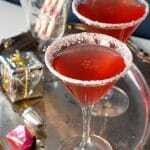 Combine in a shaker with 1 cup crushed ice; shake, strain and pour into a martini glass. Why not?! I’m all for ‘full use’ recipes! Try adding a cinnamon stick! Even more yummy . You are a girl after my own heart! Great idea! Thank you for directing me here. I am normally not a huge fan of vodka or shall I say we have a history I can not quite remember but I am a big fan of apples. Let the experiments begin. Ha! I have learned over the past year and at the instruction of local vodka distillers that it is not all created equal; with the quality of ingredients and the flavor. Most vodka has been manufactured to have no taste so it is a good mixer and frankly in this case that works to feature the infused flavor of the fruit. I think one reaps the rewards of not buying the cheapest vodka however. That helps the memory part you mentioned! I'd use the apples to stuff something. Cornish game hen, pork, chicken. Maybe chopped up with a stuffing. The residual alcohol may help tenderize and flavor without being overpowering. Hi Anonymous! I'm one for using everything so absolutely think there MUST be a home for these drunken apples. This was my first infusion and since I've found uses for every subject of my infusions! My suggestion would be to taste the apples and consider best flavor matches. Over ice cream (not sure about he vodka taste as you mention)? 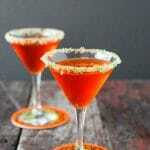 Maybe blend them into a puree to add to a souped up Apple Vodka tonic? 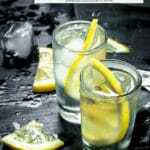 Most vodkas have little flavor. If that is the case with the one you used maybe they could be migrated into another dish with let's say pork? I've got a batch infusing now too. Once it's done I'll share any divine wisdom as I too plan to use the apples even if it's just sucking on them in a quiet corner of the room! could something be done with the appples other than tossing them out. I'm straining apples that I have been infusing for two weeks. One jar of apples and vodka and one of apples and brandy. I'm using my brandy soaked apples to make a drunken apple pie but I'm not sure about the vodka soaked ones. It just seems like such a waste to toss them all out. Thanks everyone for your comments! 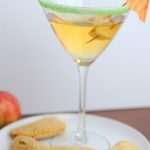 I loved the soft essence of apple in this vodka AND the martini recipe was flavorful without whacking you across the head. Thoma: infusing is the process of bringing the flavors of one thing into another. So in this case by soaking the apples in vodka, the vodka takes on the flavor of apple. Nicole: your liqueur sounds great! A definite upgrade of the kalhua I made in college for gifts(poor recipients). Ali: most hilarious thing I've ever heard! Dare I ask, had you intended to try to make this or was it a side affect of your party?! How much vodka does your recipe require? It wasn’t a measured amount; just enough to cover the apples! My guess would be between 3-4 cups. Brilliant! Make your apple flavour for vodka can be used with so many recipes or simply drank on it's own. What a great treat to serve to guests. Nice idea. For Christmas, I made a coffee-chocolate liqueur with vodka, 250g of raw cocoa nibs, 150g of whole dark-roasted coffee beans and 500g of sugar. Mix it all together in a mason jar, then let it infuse for 6 weeks, giving a gentle shake once a week. End result – WOW!!! Yum. This sounds a lot better than the kettle-corn infused gin I made for Halloween. Warning: do NOT, under any circumstances, infuse gin with kettle corn. Nasty. I don't drink vodka but i am going to try this with different sodas ….i am sure apples mixed with sprite or mirinda would be mind-blowing too. your apple vodka is a great idea for a party. I'll give it a try next time we're throwing a cocktail party. Your apple infused vodka sounds really good. I'll have to give it a try. I've tried making lemoncello before — it was pretty good, but this apple drink is very intriguing! Gotta try it. I just read today somewhere — for the life of me, I can't remember where!?! (but I'll remember) — how to make vanilla extract, with beans and vodka. Oh I love this! My husband and I have a mini-tradition of trying new cocktail recipes every weekend, but often we just end up with a regular martini because we can't think of anything. I am doing this for certain, it's such a great idea!